Is the fiery McCann a fit for the Phillies? It’s time – we are now beyond the start of Free Agency at 12:01 AM November 5. We at Phillies Nation will take a look at a players, namely outfielders, catchers, starting pitchers, and relievers, who the Phillies may target this offseason. We will explore potential performance, fit, cost, and feasibility. We continue today with left-handed catcher Brian McCann. And a reminder: you can check out all the “Pass or Play” posts by clicking on the category hyperlink. 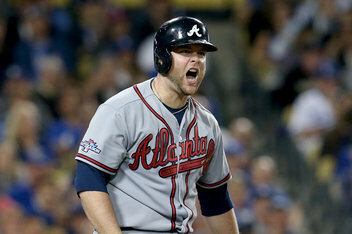 McCann, 30 on Opening Day 2014, has hit .252/.329/.441 since 2011, placing him tenth among free agent catchers in batting average, third in on-base percentage, fourth in slugging percentage, and third and on-base plus slugging. Of this free agent class, he ranks among the most durable catchers, trailing only A.J. Pierzynski in plate appearances since 2011 among free agent catchers. McCann has been an All-Star in seven of the last eight seasons but his stats tell the story of a rapidly aging player. Through 2010, McCann had a career triple-slash line of .289/.360/.489 compared to a line of .252/.329/.441 since. McCann has maintained his power but has lost some selectiveness at the plate, attributing to a decline of 30-40 points in each of his triple-slash categories. In a line-up in need of right-handed hitters, McCann does not fit the bill of what’s needed, from a handedness perspective or from the perspective of adding an on-base threat. Per FanGraphs’ version of WAR, or by viewing their triple-slashes over the last three years, McCann would not present an upgrade over Carlos Ruiz, not even in slugging percentage like Pierzynski or Jarrod Saltalamacchia would. McCann, at 30, isn’t old but he has aged much faster than players of comparable age and wear, like 28 year-old Saltalamacchia. A report came out yesterday from CBS Sports Jon Heyman stating McCann may get a contract worth over $100 million while FanGraphs estimated his worth around four years, $60 million. Either way, the cost is likely prohibitive for the Phillies. This one is probably less than zero: Heyman cites the Yankees, Angles, Red Sox, and Rangers are all interested in McCann and have the resources to sign him. The Phillies likely can’t and shouldn’t compete with those teams. McCann’s rapidly declining performance is definitely enough to stay away. And the fact that he may be set to make between $15-20 million a year is the icing on the cake. No reason to compete to sign McCann.